Remember that one time I had an existential crisis on facebook? Lol just kidding it wasn’t the first nor will it be the last. They say misery loves company but I say it likes an audience. I’m waiting for the bus, it’s the evening. The weather is perfect tonight in Bordeaux, (thanks global warming) and I’m emotionally hungover for what feels like five weeks but I know really it’s been 3 days because I have a mood tracker because I have no concept of time right now. Or…often, really. 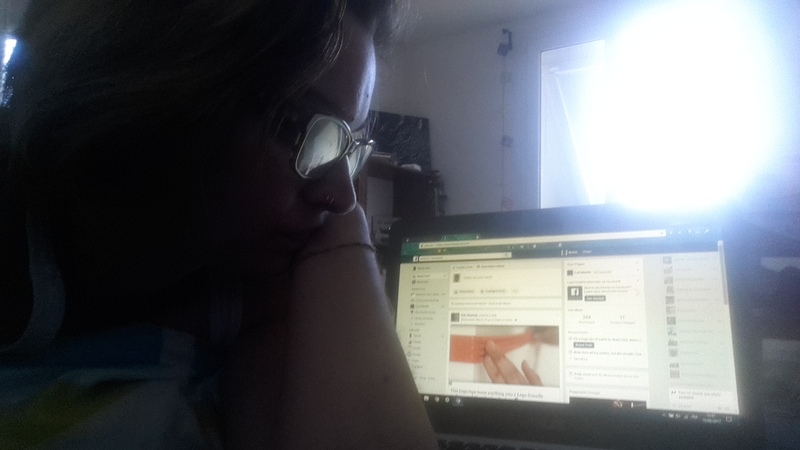 I’ve written out a tangent on Facebook after 3 days of crying. You’d think I’d get exhausted of them. But if an existential crisis just means that I’m growing or devolving or however it does what it does, that brings better peace of mind, then I’m going to keep wanting to do that thing. And so another great thing about me turning my life into some kind of dark sitcom (in my head. Where my audience is. You understand.) and for the entertainment of whoever might be on Facebook, is that it also starts a conversation. If I don’t voice it, it doesn’t come out, and it stays closed up in my brain cave where it can get dark and murky if I don’t let the light in through the cracks. And the second people started to reply, I felt better. First off, it isn’t an uncommon thought. I legit thought I was the only one who hadn’t gotten past that level. (Video game metaphor now let’s keep up.) If was comforting to find others that I value and respect be on that level as well. Also I laughed at this, because how often do we reach out to people and be all, “I KNOW HOW YOU FEEL” but you’re stuck too. Compassion is my best friend. Which in turn got my mind running another direction that isn’t downward spiral. There was a long conversation that happened with the two different people of the two different messages above. I also am having an ongoing conversation about this with my mom over whatsapp. But the cherry on the cake was the engaging heart to heart I had with probably my favorite person of the week. He listened thoughtfully but also offered paths that I agreed with which was validating. I am ok sharing a common truth with people I respect. No image caption of that because it was a moment in real life with no record of it except how I feel. And while I have no answers, I do have a path I’ve decided to take. Again. At least for me. 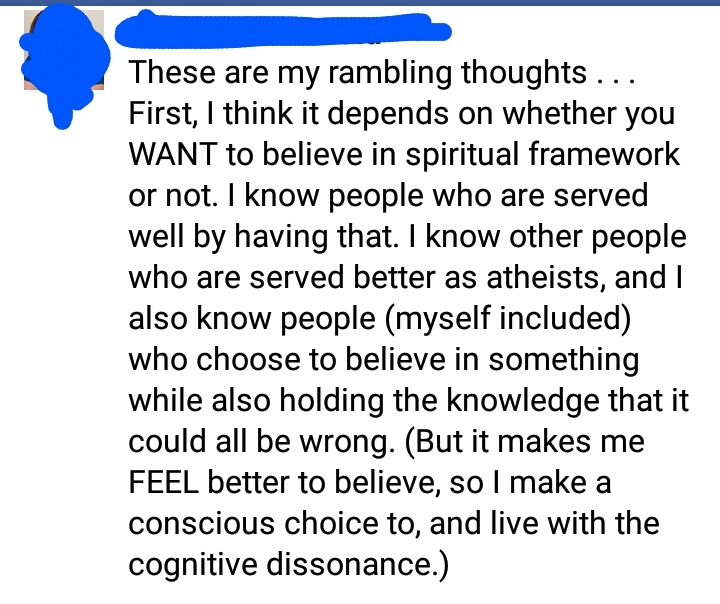 My friend commented the above text and i knew i choose the spiritual framework because its the closest to truth that ive come. Whether that happens through a connection to nature or self or a god type or religion or art, it’s all a language that essentially explains something we all know but can’t comprehend as humans. So I just try to talk to it through all means. 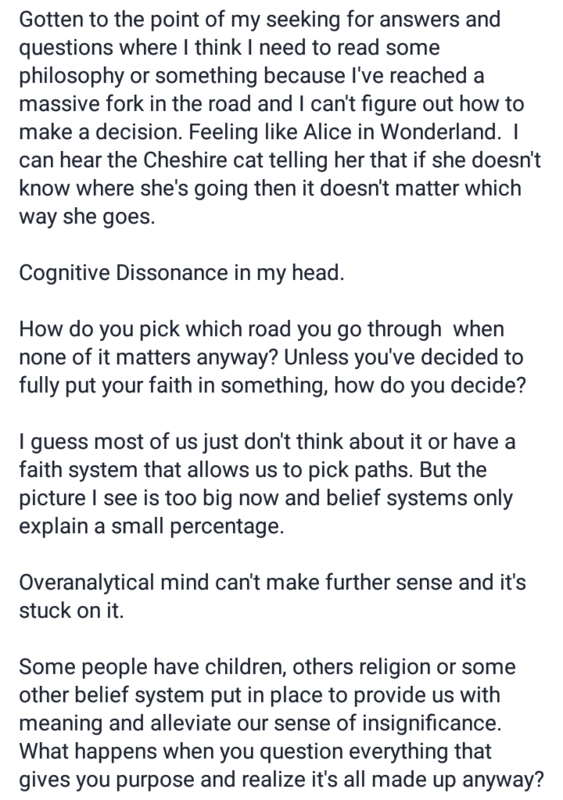 Or at least that’s the truth I’m using to appease the cognitive dissonance of existing. My friend who I talked to yesterday say that if we spend too long asking ourselves these questions, it only leads to heartache. I agree. 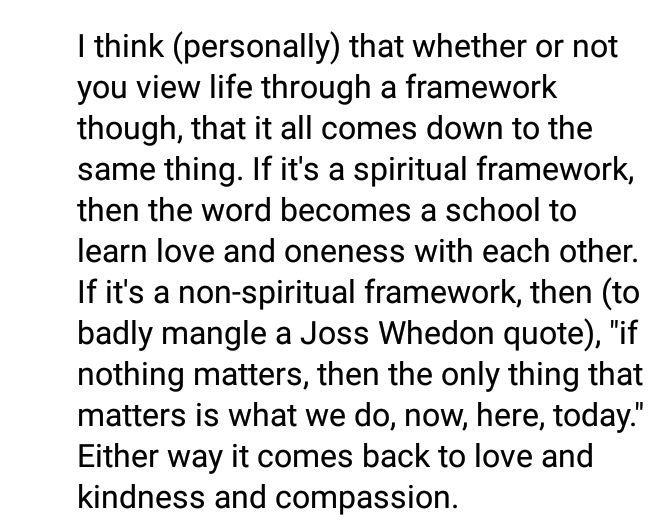 But if we never question where our values come from, how can we know we are truly living by our own values and not those that have been put there for us? How do we know we’re living our own lives and not just the life we think we’re supposed to be living? In speaking with my mom, we mention God. We use the word God sometimes to explain what we mean, but I am more of a “The universe” type person because I think if there is a god, there’s probably not just one. She doesn’t mean god either. But it was the word we chose for the moment. How do you trust? How do you take another step forward? For me…it’s about doing what I want, because what I want is to be of service. To be a vessel of goodness. And that feels like it’s an ok thing for me to trust. We decide. And sometimes that’s too overwhelming. But thanks to people who stepped up to the plate and had this conversation with me (shout out to: mami, Marste, Arthur, insta life coach friend who’s name i don’t know, and Kini.) I chose a path…for now. Of day by day intentional living in service to others, and to myself.